Recent release “Smokey Jack and the Colonel” from Page Publishing author Jon Blackwell is a thrilling tale that conveys lessons on courage and determination in facing overwhelming perils. 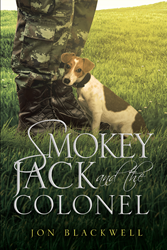 Jon Blackwell, a career chaser as a professional musician who shifted to writing novels, has completed his new book “Smokey Jack and the Colonel”: a character-driven story of Smokey Jack, a Jack Russell pup, and his riveting deeds of fighting dangers that reek of dread and evil together with his peers. Published by New York City-based Page Publishing, Jon Blackwell’s enthralling tale is a highly pivotal and magnanimous reflection of a dog’s life, and lets readers feel the suspense as Smokey Jack proves his chivalry in dealing with threats and disasters. Readers who wish to experience this masterful work can purchase “Smokey Jack and the Colonel” at bookstores everywhere, or online at the Apple iTunes store, Amazon, Google Play, or Barnes and Noble.